Cook noodles, drain. Use some of the butter to grease a 9 x 13 inch baking dish. 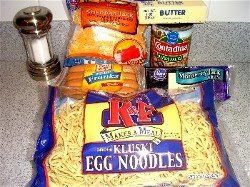 Add hot noodles and mix with remaining butter to coat. Sprinkle with a little salt. 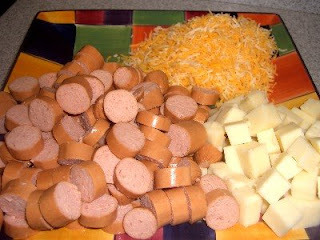 Add pizza sauce, cubed cheese, and hot dogs. Top with some shredded cheddar cheese. Bake 20-30 minutes at 350 degrees. 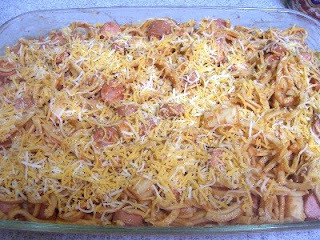 I used to take this to potluck dinners when my children were little. It was an empty dish at the end of the evening and I always had requests for the recipe. Looks easy and very kid-friendly! Yeah, my kids would love this!